The public had its first look Monday at the man suspected of kidnapping 13-year-old Jayme Closs and killing her parents. Jake Patterson, 21, went before a judge for a bond hearing in Barron County, Wisconsin, Monday afternoon. His bond was set for $5 million. NBC 5’s Patrick Fazio reports. A criminal complaint has revealed gruesome details on the horrifying series of events that took place at the Closs family's Wisconsin home on Oct. 15 — the night Jayme Closs was kidnapped and her parents fatally shot. The complaint, filed in Barron County Circuit Court Monday, details how Jake Thomas Patterson allegedly drove to the home in the early morning hours and acted out an elaborate plan to take the 13-year-old girl he had once seen boarding a school bus in the area. Jayme Closs told police that on the night she was abducted, she was asleep in her bedroom when she heard her dog start barking. She said she noticed someone driving up the family's driveway and woke her parents up, the complaint states. According to the complaint, Patterson told police that as he arrived at the Closs house, he turned off his headlights and coasted to the end of the driveway, parked the vehicle and walked to the front door. The public had its first look Monday at the man suspected of kidnapping 13-year-old Jayme Closs and killing her parents. Jake Patterson, 21, went before a judge for a bond hearing in Barron County, Wisconsin, Monday afternoon. His bond was set for $5 million. NBC 5 Chicago's Kate Chappell reports. Closs said her father went to the door to see what was going on and a man was there with a gun, the complaint states. She and her mother then went to hide in the bathroom with the door closed. As Patterson approached, he told police he saw James Closs at the front window with a flashlight and yelled to Closs to get on the ground. Patterson said he opened the glass storm door, pounded on the wooden entry door, and James Closs asked him for a badge, assuming Patterson was police. "The defendant stated he then raised the shotgun and purposely aimed at James' head and pulled the trigger. The defendant stated he knew James immediately collapsed to the ground," the complaint reads. Jayme Closs told authorities she heard a gunshot and knew her father had just been killed. She said her mother had a cell phone with her and used it to call 911, according to the complaint. Patterson told police he shot at the door, then shouldered his way in. He scanned the house and noticed a door closed to a room ahead of him. He walked through other rooms in the house and, deeming them empty, returned to the closed door, which was locked and barricaded. He shouldered it open and found Denise and Jayme Closs seated in the bathtub, "Denise with her arms wrapped around [Jayme Closs] in a bear hug," the complaint states. A 21-year-old man was taken into custody for the October shooting deaths of a Wisconsin couple and the kidnapping of their teenage daughter who was found alive Thursday, three months after she vanished. Patterson, dressed in all black and wearing a face mask, hat and gloves, handed a roll of black duct tape to Denise Closs and told her to place the tape over Jayme Closs' mouth, according to the complaint. Jayme Closs told police her mother did as she was told, but Patterson said as Denise Closs struggled, he set his shotgun down on the bathroom sink and wrapped the tape around Jayme Closs' mouth and head. He had Jayme Closs stand and placed tape around her wrists and ankles and removed her from the bathtub. 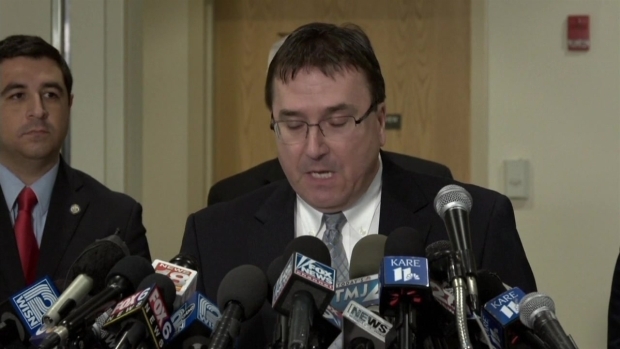 "With [Jayme Closs] standing bound next to him in the bathroom, [Patterson] stated he picked up the shotgun, aimed for Denise's head and pulled the trigger as he started to turn away," the complaint reads. He dragged Jayme Closs out of the house, nearly slipping in blood pooled on the floor, and across the front yard. He put her in the trunk and locked it, according to the complaint. When he got to his house, at 14166 S. Eau Claire Acres Circle Road, in Gordon Wisconsin, he removed Jayme Closs from the trunk and dragged her into his bedroom. He told police he knew she was "extremely scared, and she was crying." She had urinated herself, so he told her to change into his sister's pajamas. Closs said Patterson placed her clothes in a bag while making a comment about not having any evidence, the complaint states. Patterson told police he drove to the Closs home twice before Oct. 15 with the intent to kidnap Jayme Closs. The first time, multiple cars in the driveway "scared him off," and the second time he noticed lights on and people walking around inside the house. 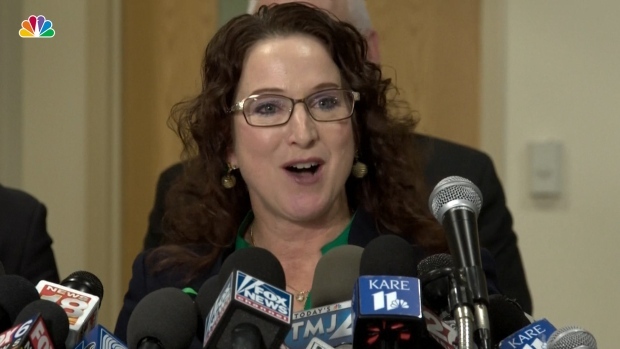 Kelly Engelhardt, Jayme Closs' aunt, tells NBC affiliate KARE that she had hope and faith that her niece would be found. Closs, who was missing since Oct. 15, 2018, was found alive close to an hour's drive away from her home on Thursday. He told police, according to the complaint, that he put "quite a bit of thought into the details" of how he would abduct Closs, according to the complaint, stealing license plates from another vehicle and modifying his Ford Taurus, disconnecting the dome light and trunk light and removing "what he described as the glow in the dark kidnapping cord" from inside the trunk. Patterson told police that before leaving his house, he stole his father's 12-gauge Mossberg pump shotgun and wiped down the shotgun shells and gun while wearing gloves. He shaved his face and head and showered before leaving to ensure no DNA or hair would be left at the scene. He put on brown leather steel-toed work boots, blue jeans and a black jacket. He also put on the mask and two pairs of work gloves. Patterson told police while allegedly confessing to killing James and Denise Closs and kidnapping their 13-year-old daughter that he was driving to work at the Saputo Cheese Factory when he stopped behind a school bus on U.S. Hwy. 8 and saw Jayme Closs boarding her school bus. Patterson "stated he had no idea who she was nor did he know who lived at the house or how many people lived at the house," the criminal complaint read. "The defendant stated, where he saw [Closs], he knew that was the girl he was going to take." The charging documents are the first to shed light on why he targeted the teen girl. Patterson made his first court appearance Monday afternoon. Prosecutors formally charged the 21-year-old with two counts of intentional homicide and one count of kidnapping before his afternoon court hearing in Barron County Circuit Court. His bail was set at $5 million. Barron Area School District Superintendent Diane Tremblay told the media Friday that the news of 13-year old Jayme Closs being found safe after going missing for several months will never be forgotten in the district. Patterson's defense attorneys, Charles Glynn and Richard Jones, said they believe Patterson can get a fair trial, but they're not sure where. The public defenders didn't reveal many specifics about what they expect from Monday's court hearing, but they acknowledged the case was "a tragic situation from every perspective." Glynn and Jones issued a statement Saturday saying they were relying on the court system to treat Patterson fairly. The complaint detailing Closs' three-month captivity states Patterson hid Closs from friends and relatives at his home by barricading her under his bed with totes and laundry bins filled with weights. He would play loud music to keep her from being heard and would tell her "nobody was to know she was there or bad things would happen to her," the complaint states. Closs was kept under the bed for as many as 12 hours at a time without food, water or bathroom breaks, officials alleged. Closs escaped after Patterson told her "he was going to be gone for five or six hours," according to the complaint. She told police she was able to push the bins and weights away from the bed and crawl out before putting on a pair of Patterson's shoes and fleeing the house. Closs was finally found Thursday, when a woman walking her dog spotted the teen along a road near Gordon, a town about an hour's drive north of Barron. The woman says the girl begged her for help, saying Patterson had been hiding her in a nearby cabin and that she had escaped when he left her alone. Neighbors called 911, and officers arrested Patterson within minutes. He has no criminal history in Wisconsin. When police later stopped his vehicle, Patterson told authorities he knew why he was being stopped and said, "I did it," the complaint states.